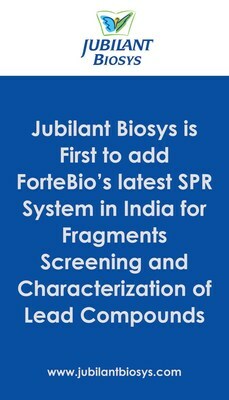 BENGALURU, India and SAN JOSE, California, March 28, 2019 /PRNewswire/ — Jubilant Biosys, a subsidiary of Jubilant Life Sciences Ltd, announced today that it has added advanced Pioneer FE system to its platform of drug discovery solutions available to customers. The Pioneer FE system from ForteBio, the Biologics Business Unit of Molecular Devices, represents the next generation SPR instrumentation for label-free characterization of biomolecules. The Pioneer system uses a unique OneStep® gradient injection technology to facilitate fragment screening and is also sensitive enough to measure high affinity and covalent binding events. Pioneer systems with OneStep® technology can analyze up to 768 fragments in 24 hours, obtaining kinetics during the primary screen and eliminating the need for additional screens. Molecular Devices, one of the world’s leading providers of high-performance bioanalytical measurement systems, software and consumables for life science research, pharmaceutical and biotherapeutic development. Within the broad product portfolio are platforms for high-throughput screening, genomic and cellular analysis, colony selection and microplate detection. These leading-edge products enable scientists to improve productivity and effectiveness, ultimately accelerating research and discovery of new therapeutics. Molecular Devices is committed to continual development of innovative solutions for life science applications. The company is headquartered in Silicon Valley, California with offices around the globe.